I love grocery shopping. Probably more than the average person, so when Plated showed up on Rue La La I wasn’t that interested in trying it out. While I was debating whether to buy the voucher, I went to Plated’s website and looked at the meal options – and to my surprise, they looked awesome! 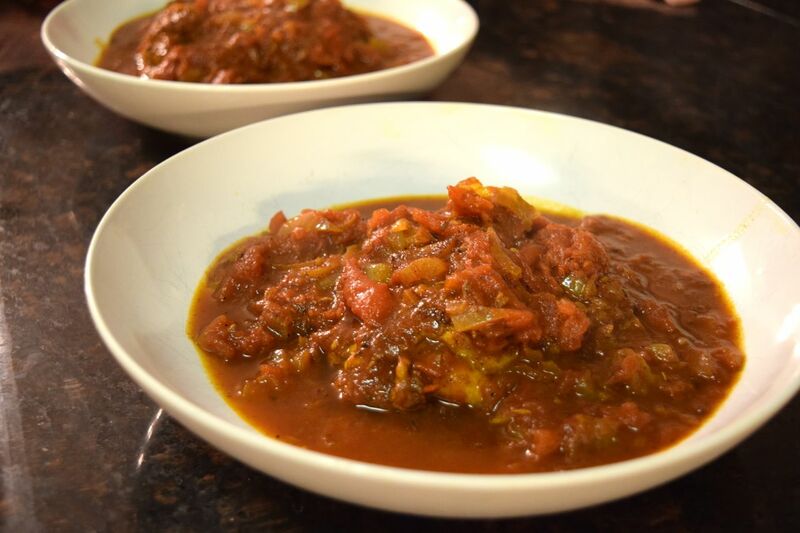 For instance one of the available meals I ordered was Skate Fish – something I have only had once, and have been really wanting to try to cook myself. The perfect excuse. The Rue La La discount + my store credit = let’s try this sucker out! Well the week came (last week) where Plated was needed in our lives. Mostly because we had blown the majority of our food budget on beer and eating out while Tim was here. I went on to Plated’s website to search for meals. Their website is incredibly user friendly. I settled on their Baked Gnocchi, Skate Fish, and Tunisian Chicken, with a scheduled delivery date of 3/25. I got notice that the box was on its way on Monday, and I was super excited!!! When I got home Tuesday the box was waiting by my door. 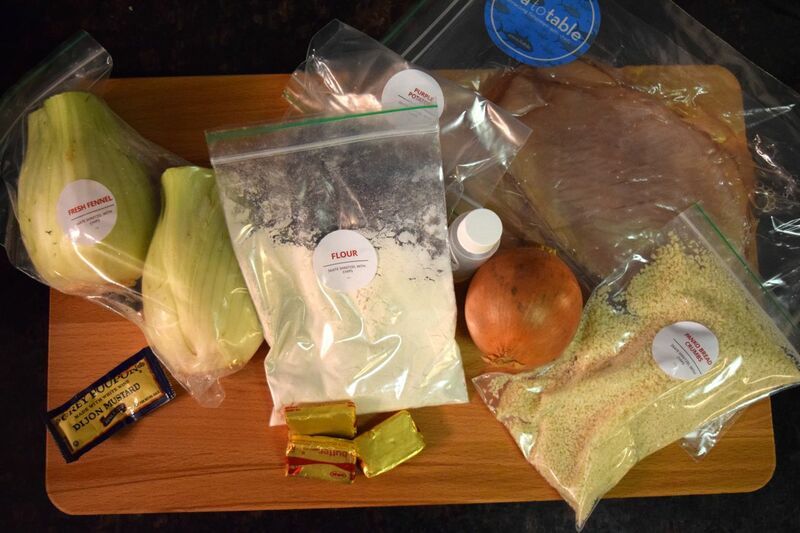 Not sure who invented the packaging for Plated, but I assume it is an ex-NASA employee. This box is on lockdown. You could easily repurpose it as a cooler. 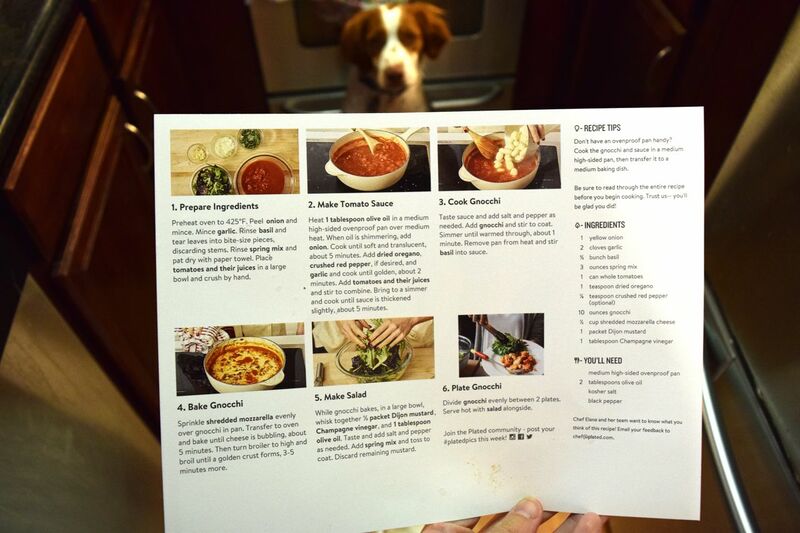 The first thing I noticed was that one of the recipes they sent me was wrong. (Whoops!) I called to let them know and they apologized profusely and offered to email the right recipe to me, and explained that all of the recipes were on the website as well. The first awesome part was that I got to talk to a real human with very little hassle, and the second part was that they were so nice! I wasn’t upset – just needed the recipe. 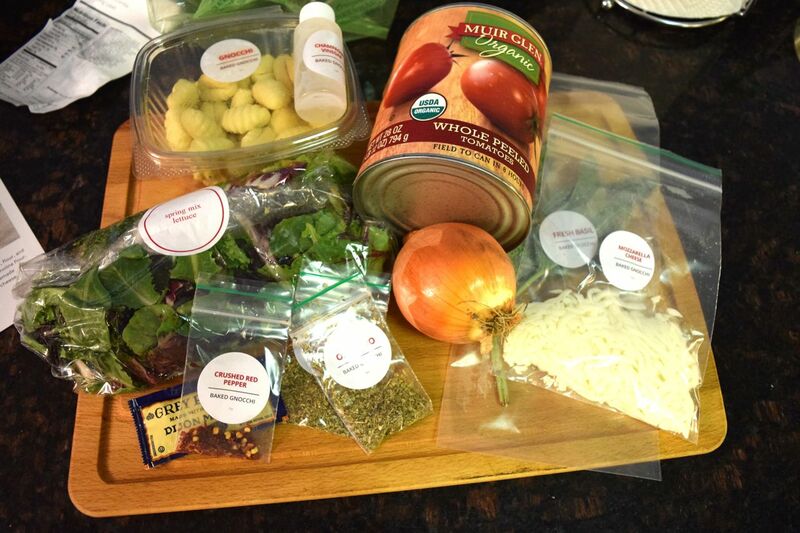 Each recipe came with its own bag of goodies – and if an ingredient was loose, it was still labeled. Very organized!!! And I love organized. Like, a lot. The first recipe we tried was the Baked Gnocchi. I set up all of the ingredients and read briefly through the directions. Word to the wise – don’t do this, instead read the directions VERY thoroughly. What threw me, was that the directions are given in paragraph form. I am more of a list person – so I definitely skipped over a few items in the paragraph, which caused some confusion later. (Not their fault… my fault). 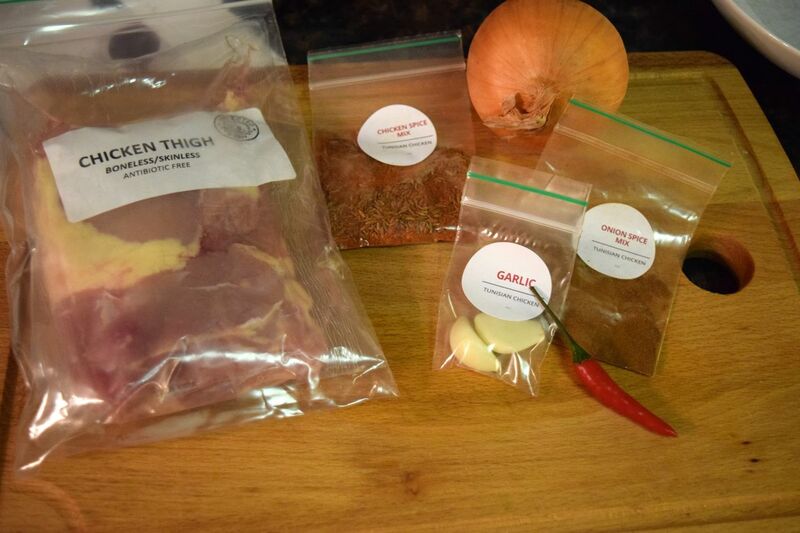 Another oopsie – they forgot to send garlic! We got two packets of oregano, but no garlic! Luckily we pretty much always have garlic in the house… for vampire protection and such. When I let them know about the missing ingredient, they credited me $8, which I thought was nice. Tucker was all about Plated. I started the gnocchi recipe – it was pretty easy, it did take a little longer than they said. But that may have been my fault… I omitted basil from the sauce, since I’m allergic. (Fun fact!) The sauce was rich and delicious, but also super simple. I’ll definitely make it again using my own ingredients. 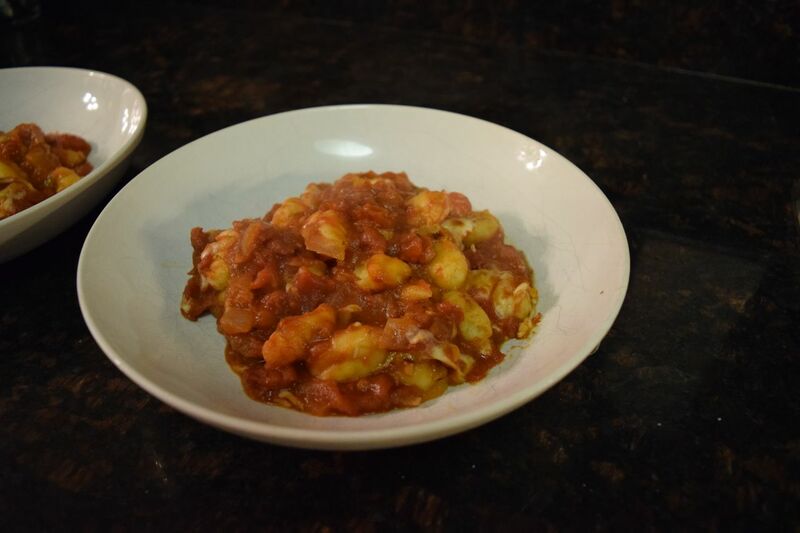 The gnocchi was great – well made, and considering that I have yet to master gnocchi from scratch, much more successful than our last homemade attempt at gnocchi. In my opinion there was not enough cheese, because there is never enough cheese. 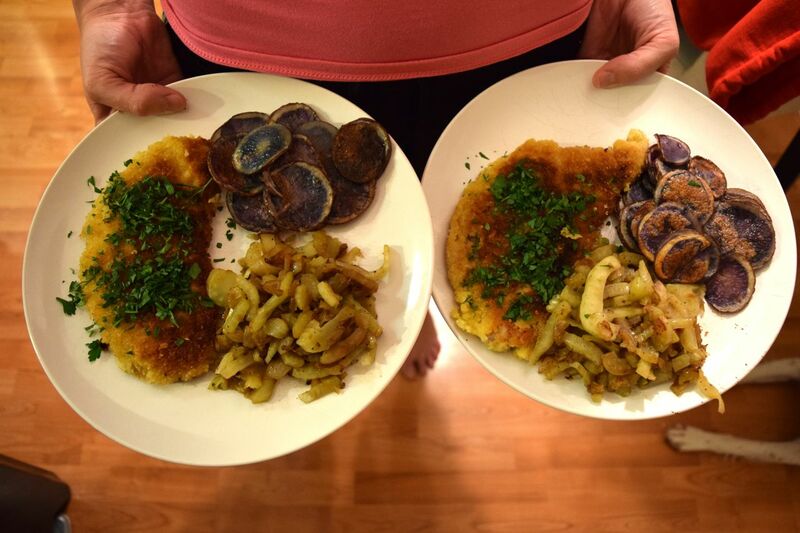 On Thursday we made Skate Fish Schnitzel – it was absolutely delicious but made a disaster out of our kitchen. Like tornado disaster. I think it was worth it. The weird thing about this recipe was that an ingredient (parsley) was given directions on how to prepare – but not what to do with it! We figured it was probably for garnish so we used it during plating. Also, we made the mistake of starting the sauce when the pan was too hot. Insert vinegar explosions and “oh sugars.” Total failure. I didn’t know you could burn mustard. A little bit of lemon on the Skate went a long way, and I like to pretend that this made it “light” because it had less butter. The sides to the Skate Fish were purple potatoes and fennel. I have had some experience with purple potatoes, which are potatoes that are purple… not terribly complicated. The fennel, however, I had never cooked with. We use fennel seed pretty frequently, but I had never started from the raw stuff. It is really good! See this is the benefit of a service like Plated – you end up trying different foods, and liking them! Definitely a win for Plated. Our skate fish night was also Tucker’s birthday – so we finished off our Skate Fish with Sprinkles cupcakes. I am #TeamSMore ALL THE WAY. Charlie said the Salty Caramel was average. I don’t even understand why it is a competition. It should be S’More time all the time. Tucker was excited because #TuckerWantsSome finally became #TuckerCanHaveSome! Cannot wait to try out some dog treat recipes in the next month or so. The last meal was Tunisian Chicken. To be honest I pretty much ordered this for Charlie. He likes spicy food WAY more than me, and this looked spicy and delicious. The prep was pretty simple, marinate the chicken while you saute some onions and smoosh some tomatoes with your hands. *Cooking Tip* Make sure to remove the seeds when you are cooking with peppers. I learned this the hard way. Actually, Charlie learned for me – I basically made him pepper spray nachos the first year we were dating. It’s a miracle we made it. And in the interest of full disclosure, we added waffle fries. Because we apparently are incapable of eating dinner without a starch. I had never cooked with chicken thighs prior to this, and I have to say I prefer the breast meat. But Charlie was 100% totally sold on the meal. What is nice about Plated is that even though they sent “spice mixture” they also included in the recipe all of the spice contents, so we can replicate the mixture. Charlie wants to take the sauce portion of the dish and make a vegetable stew to serve over cous-cous and goat/feta cheese. I think I love him and want to marry him all over again. Overall, Plated was a great experience. I can definitely see the advantage of a service like this if you’re a busy professional, or live in a city like LA where it takes 3 hours to drive the mile to the grocer. I think I’ll stick to doing my own shopping for now – but I am definitely going to keep my account for the future! *Please note that Plated in no way compensated me for this average review. I’m not that cool.